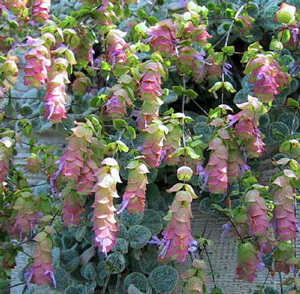 'Oregano-Dittany of Crete' is a uniquely beautiful herb with trailing clusters of pink to purple blossoms with deep lilac corollas and vivid pink overlapping bracts that sit atop wooly, grayish sage green leaves. This highly fragrant plant is grown for its healing properties and for making incense. Sunlight required: Minimum 4 hours; midday sun is best. All our 'Dittany of Crete' Oregano Plants are organically grown and shipped in fine quality growing medium. They are guaranteed to arrive alive and ready to plant. Comment: These plants came quickly and in good order. I put them in the ground and they have really taken off. I expect them to do very well...thank you again for a fast, accurate and well done job GrowJoy! I will continue to do business with you because of the trust developed over the years. "Love our new Dittany of Crete plant!" Comment: Shipping to our home in Florida was fast and the Oregano-Dittany of Crete Herb Plant arrived in great condition. We transplanted it into a new pot and it is doing great! Thank you for the quick service! Hope to do business with you again. Comment: A bit smaller than I expected but will pot these (got 2) healthy, shipped very professionally with no damage and doing well in the garden. Comment: What a cool Herb this Oregano is. Amazing, wonderful aroma and looks very unique! Thank you! "Oregano Dittany of Crete Herb plant"
Comment: Love this Oregano! Thank you plants arrived safely! Comment: The Oregano Dittany of Crete plant arrived in excellent condition! Comment: I haven't used this in cooking yet but it is a beautiful addition to my small herb garden and almost too pretty to pick! It has a lovely aroma too.